I like the high armsyce in this top especially. No gaping in the front armhole! The dart is supposed to be sewn downward but I flipped it up. 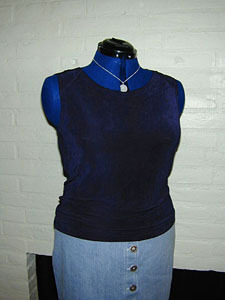 So, this is my first knit top that actually had a dart in the pattern already. Interesting! No alterations. I traced the pattern and decided the bust apex hit in the right spot, everything looked good, so no FBA. The hem is turned up 1.25”, topstitched 1” from fold and topstitched again 1/4” from first line of stitching. This seemed to be a nice idea so I double stitched around the neck and armholes too. Experimenting is fun! The back shoulder seam is long. It comes up and over the shoulder and attaches to the front at the collar bone level (I think you can see it in the pic although the fabric is dark). I thought it made an interesting design element but worried the slinky might be too heavy and try pull it forward too much. Staytape did a good job of keeping that seam from stretching out (all looks good) but time will tell how well this top keeps its shape everywhere else. Although this pattern is out of print, it is a keeper. If you come across it snap it up without delay. Easy top to whip out for everyday casual wear. I will definitely make more of these tops for gym wear and just to wear around the house. This fabric plus the shoulder design really sets it apart from regular sleeveless tops. Very nice basic top. Like the pattern and if I could find it, I’ll buy it. Thanks for the review. Great color – you should get a lot of wear out of this.